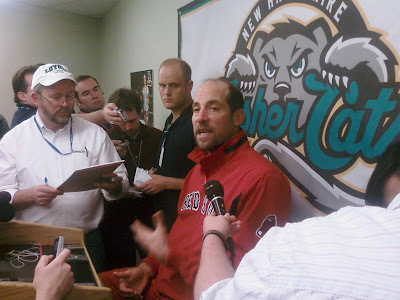 John Smoltz made his 2nd rehab start, this time for The Portland Sea Dogs in Manchester, NH. Oh yeah, there was a game too..Aaron Bates blasted his 5th HR in the 5 - 1 win over the New Hampshire Fisher Cats. Cue King type music....TOM BRADY IS ON THE FIELD AGAIN!! Jon Lester was not his usual self once again and Big Papi was dropped to 6th in the lineup as the Boston Red Sox lost to the Minnesota Twins 5 - 2. Kevin Garnett has knee surgery.